Brett Favre threw three touchdown passes for the second straight game, leading the Green Bay Packers to a 31-24 win over the San Diego Chargers at Lambeau Field. The win pushed the Packers to a perfect 3-0 to start the season. Favre&apos;s three touchdown passes gives him 420 for his career and ties him with Dan Marino for the all-time NFL lead. Number-420 went to second year receiver Greg Jennings on a quick slant that he took 57 yards for the go ahead touchdown. The Packers remain one of the five unbeaten (3-0) clubs in football and extended their NFL regular season win streak to 7, dating back to last season. 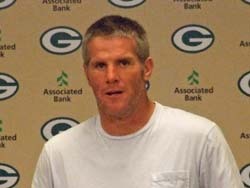 Favre (pictured) seemed relieved to get the record tying touchdown pass behind him. He reached 420 in 240 games, the same number of starts it took Dan Marino. Favre led a Packers comeback win for the 21st time in his career and surpassed 300 passing yards for the 49th time. Defensively, the Packers did a great job stopping the Chargers potent running game. Ladanian Tomlinson finished with 62 yards on 22 carries and the Chargers had 73 overall. The Packers averaged 3.2 yards per carry, but the running game was not a featured aspect of the offense on this day. The Packers rushed it just 13 times for a total of 42 yards. Rookie Brandon Jackson was the leading rusher for the Packers with 22 yards on 6 carries. Up next for the Packers is a trip to Minneapolis to face the Vikings on Sunday.